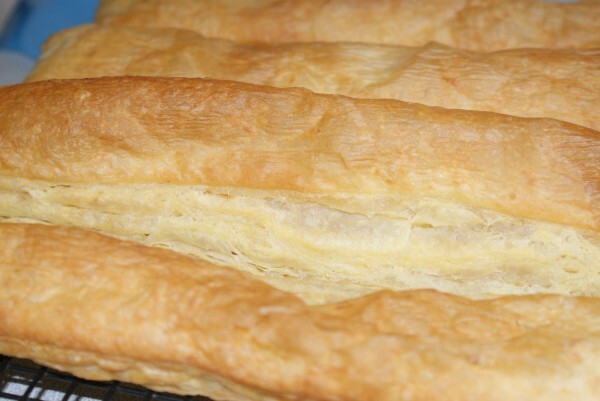 This version of puff pastry is referred to as rough puff pastry, the idea being that you only get 75% of the rise that you would get with traditional puff pastry – getting technical there! 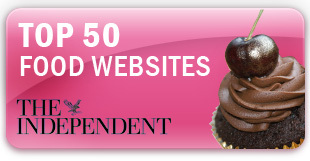 However, when you see the rise you get with this its far above and beyond shop bought. 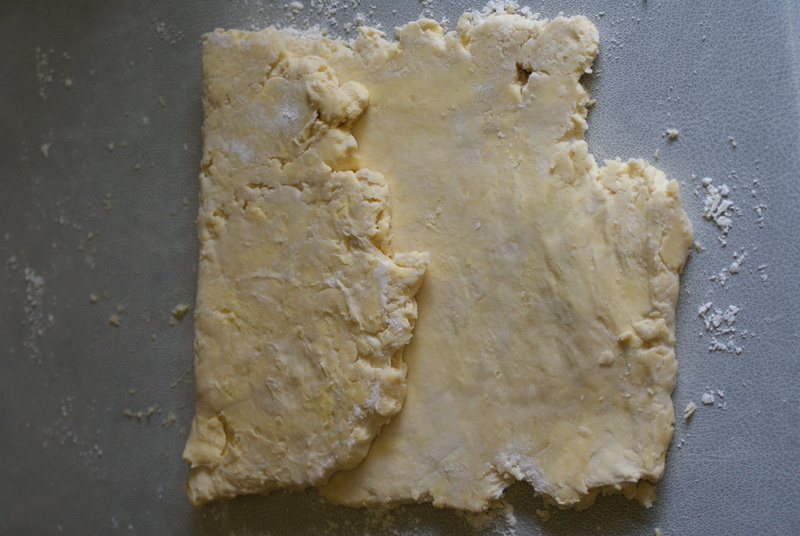 Puff Pastry takes a couple of days to do and also means you have to wrestle with a full pat of butter – hmmmm, I can be organised but not that organised! 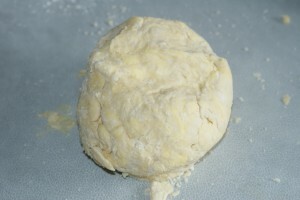 To make the rough puff pastry add the flour and salt to the bowl of a food processor and give it a quick pulse to mix. 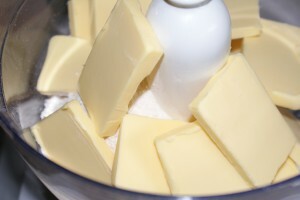 Cut the cold butter into 1/2cm slices and add to the food processor bowl. 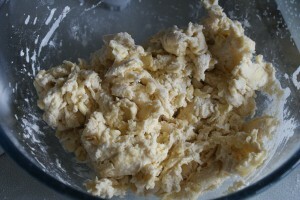 Using the pulse function whizz until the butter is broken up but still in visible lumps. 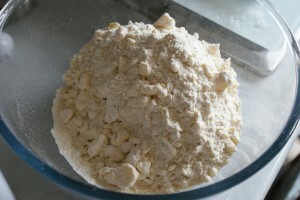 Tip the mixture out into a large mixing bowl. 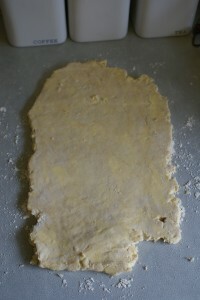 Make a well in the centre and add the juice of half a lemon and then enough super cold water to make a dough. Use the blade of a table knife to mix the dough rather than your hands as you don’t want to melt the butter. Once the dough is into a ball wrap in clingfilm and pop it into the fridge for an hour so that the butter hardens up again. 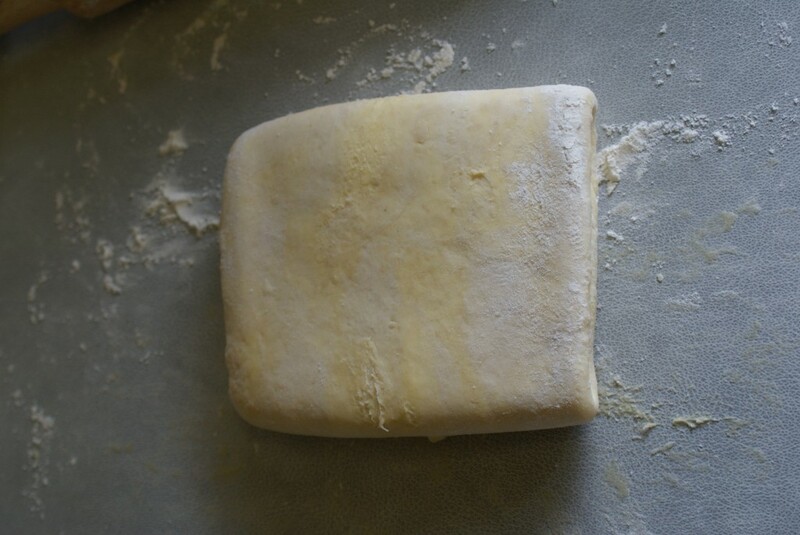 After an hour take the dough out of the fridge, lightly flour your work surface and then roll out the dough into a rectangle shape. Fold into three like an envelope (see pictures below). 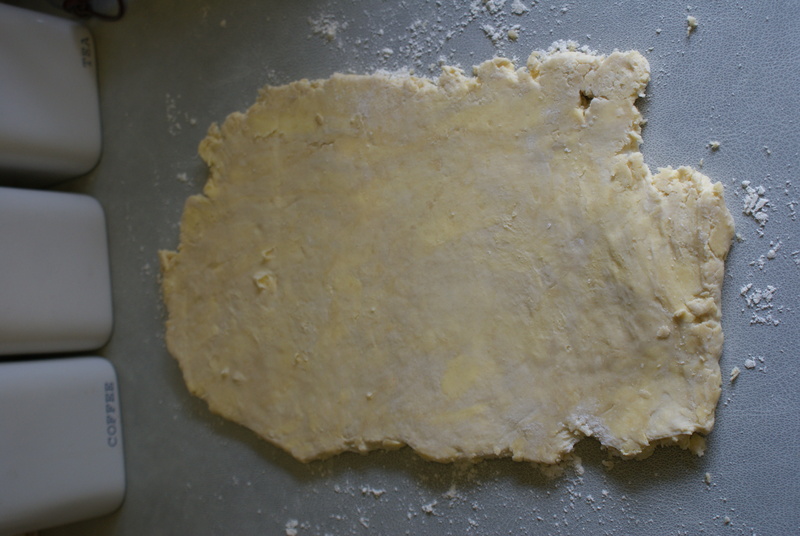 Turn the dough 90 degrees to the right so that the folds are now left and right. Roll again to a large rectangle and fold into three again. Turn and then repeat this step twice more, turning before each re-rolling and folding. 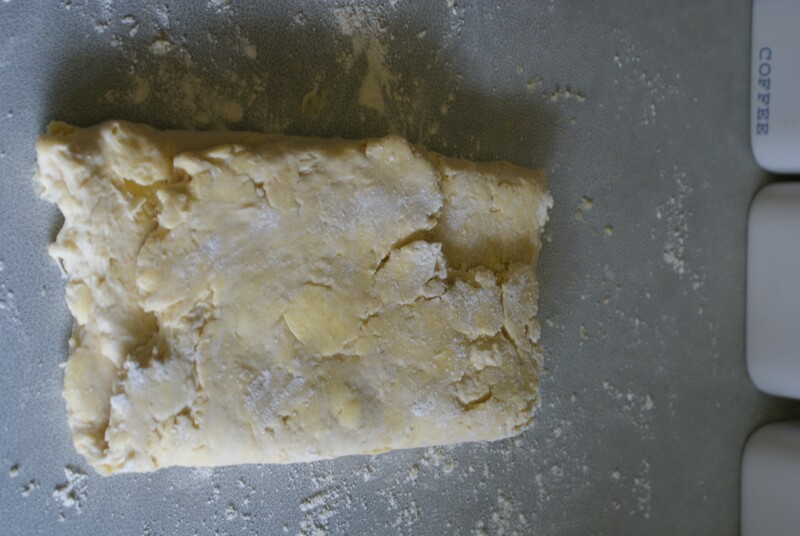 Each time the pastry gets smoother and more refined. Wrap again in clingfilm and allow it to chill for another hour in the fridge. See? – It wasn’t difficult was it? 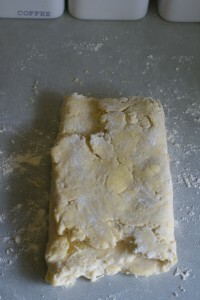 The pastry is now ready to be used for whatever you need it for. 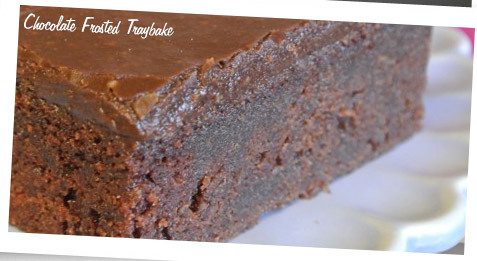 It can be frozen, wrapped well in clingfilm for upto six months. When defrosting, just make sure it stays dry and doesn’t sit in a pool of water. Half a block is sufficient for a puff pastry top for a pie so it may be a good idea to cut it into half before freezing. 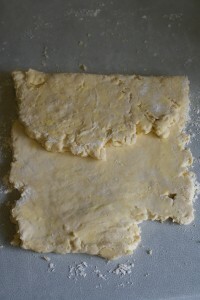 Traditionally you shouldn’t re-roll puff pastry trimmings. 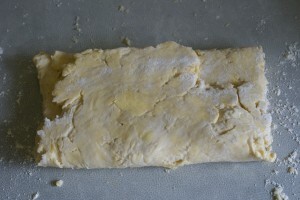 It disturbs the buttery layers within the pastry which you’ve worked so hard to create. However, you can. In these times throwing away pastry trimmings is wasteful and I just can’t do it. Gather together the trimmings and gently squeeze them back together as a ball. Chill this wonky ball of pastry for half an hour or so until firm again. 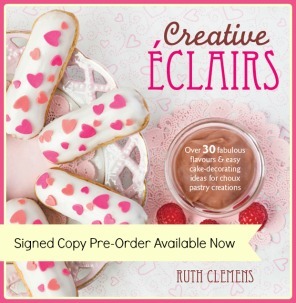 This entry was posted in How To, Pastry, Ruth's Chat. Bookmark the permalink. 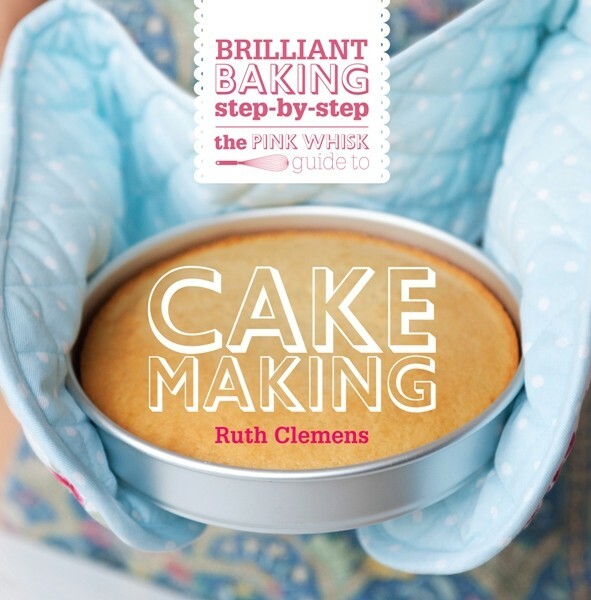 While making one of my frequent visits to “Made with Pink” I stumbled across your blog; I have to say it is fantastic! 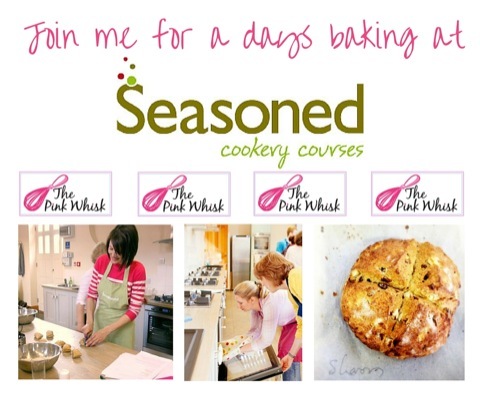 Your recipes are really clear and easy to follow – I cant decide which to try first! Thank you for sharing such yummy treats with novices like myself! I found your website by accident I really do love your clear concise instructions (especially with the pictures). I have already tried quiet a few! Just one questions which is probably tired Mummy brain, but is strong plain flour and strong plain white bread flour the same? 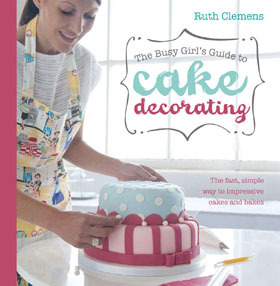 Also loved your videos on you tube for National baking week, they were very informative and almost convinced my husband to have a go in the kitchen! Thanks. Thanks for the recipe and the great picture instructions it made it really clear so my first puff pastry was a success! Sorry for the dumb question, in total 4 envelope folds is it? I have always been a chicken with puff pastry, I just keep coming back to your post over and over again and I think I finally have the courage to experiment! I’m jot sure if I’m missing it. Did you mention how much salt to use?